Well, am I ever happy to have ordered the e.l.f. Essential Nail Polish Remover Pads. I tried these handy little things when I was on vacation, and I was aboslutely blown away. They have a bit of an oily feel, yet dissolve polish so well. Although the scent is a bit weird, the liquid they're saturated in doesn't evaporate as quickly as your typical polish remover. One small pad will successfully remove one hand/foot of dark polish and won't break down or rip. So technically you can get 12 uses out of a $2 container. If that isn't a steal, I don't know what is. I haven't tried them on glitter polish yet, but I'll be sure to document my results if I do. I couldn't see them working very well on glitter since they don't contain acetone. That being said, my hands are left feeling clean and nourished after removal, with no dryness around my nails. The container weighs nothing and don't leak when travelling. I don't notice a real citrus scent, but they're definitely not as smelly as typical polish remover. Once the pads are finished, I'm sure you could even reuse the cute, small container for something else. For just a toonie, these are now a must-have in my travel bag. 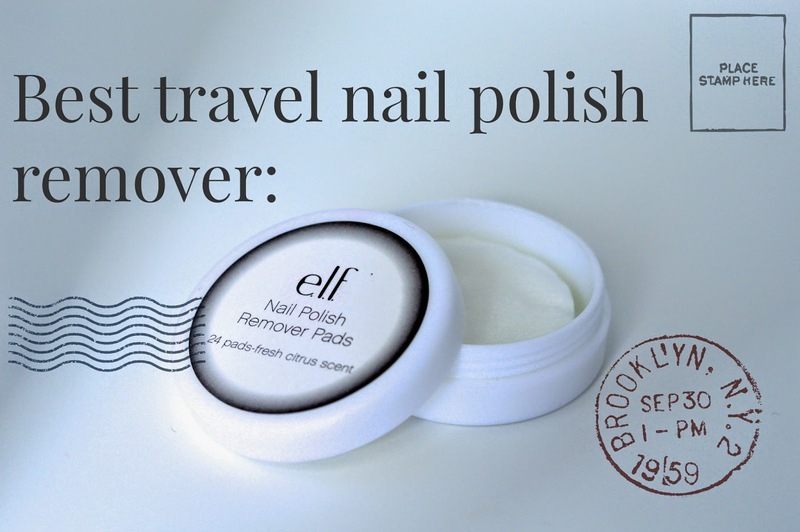 If you find yourself purchasing some e.l.f. in the future, definitely give these a try!